Samuel S. Young of Eaton, Ohio, USA, patented three simple calculating devices in the middle of 19th century. The first patent (US patent No 6602 from 1849) was for machine for adding figures. The second patent was for machine for calculation of interest (pat. No 8329 from 1851). The third patent (pat. No 21921 from 1858) was for arithmetical proof-rule. It seems an adding device, based on the first patent of Young (see the patent drawing below), was manufactured and became rather popular in 1850s in USA. According to possibly exaggerated advertising, more than 30000 examples of this had been sold by 1857. The patent model survived to the present and it is kept in National Museum of American History, Washington (see the upper image). I am agent for the sale of Young's Patent Adding Tablet a very ingenious machine for adding up columns of figures, to any amount with accuracy and rapidity, without mental labour, they are very generally used by Bankers, Merchants, Storekeepers & Accountants, as evidence of their popularity, over thirty thousand have been sold already. It will be sent by mail on receipt of One dollar, or one dozen for Nine Dollars. 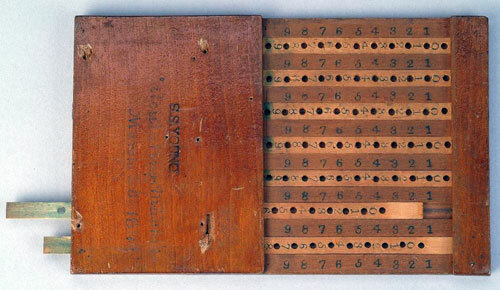 It was a wooden device, with measurements: 7 cm x 9.8 cm x 15.6 cm. The simple adder with a frame holds seven strips of wood. Each strip has 19 holes on it. The ten right holes are numbered from 0 to 9. The nine remaining holes are unnumbered, but the wood is colored green. To the sides of each strip, the numbers 1 to 9 are written on the frame. The left part of the strip is covered by an upper piece on the frame. Similar simple calculating devices as the above described remained popular till the middle of 20th century, see for example devices of Fowler and Locke. Who was the inventor Samuel S. Young? Little is known about him. The US Census for 1850 indicates that S. S. Young of Eaton, Ohio, 40 years old that year, was living with his wife (Young married on February 13, 1834, to Eliza Jane Hardy) and two children. His occupation was given as "gardener." Apparently by 1860 he had moved to the nearby town of Washington and is listed in the Census as a "horticulturalist" by occupation. In 1864 and 1865 Young was working in the real estate and rental business in Cincinnati, Ohio, along with one of Red Lion's and Warren County's most distinguished and prosperous citizens and match manufacturer, William H. Ballard.